I’ve never been a smoker and certainly don’t think I’m missing out on much. I guess most of us know that smoking is bad but yet, it’s a personal choice. However, you wouldn’t really want to drink your cigarette would you? Even though these teabags are just shaped like cigarettes, there’s something utterly gross about seeing them in your sticking out of your cup of tea I think… Smokers may enjoy it, who knows. 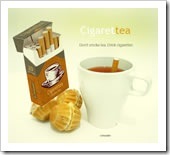 Instead of tobacco, the cigarettes contain tea leaves. All you have to do is dip one in a cup of hot water and let it steep. This entry was posted on Tuesday, April 29th, 2008 at 2:52 pm	and is filed under Funny, Odd & Bizarre, No Thanks. You can follow any responses to this entry through the RSS 2.0 feed. You can skip to the end and leave a response. Pinging is currently not allowed.